First of all, I need to go ahead and admit that this project was incredibly close to hitting the cutting room floor. I mention that by way of a little reminder that my DIY projects are far from consistently successful, and that trial and error is just part of the game in the life of a crafter! Although things didn’t go quite as I had planned with my DIY painted frame idea, I ultimately ended up with something that I could be proud of: a colorful commemoration of my trip to the Wynwood Walls of Miami. Find out how I managed to pull graphic inspiration from my trip to the graffitied art district, plus the major painting hiccup I experienced while covering my wood frame in pattern—the candid story is below! To start with, I needed to grab an inspiration image from my trip. Since I knew I wanted to pay hommage to my trip to the Wynwood Walls, I pulled up the camera roll on my phone and chose a wall design that I could replicate easily enough on my wooden frame. The final choice? 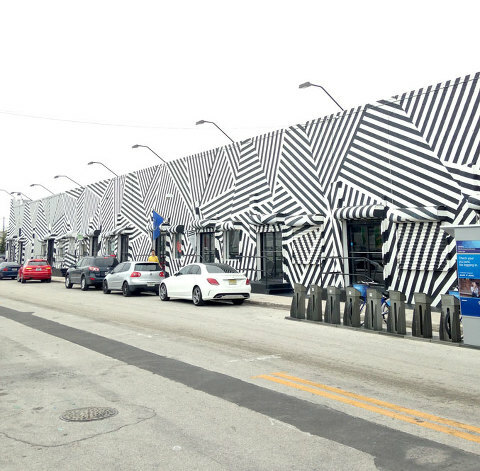 The iconic black and white striped pattern on the WYNWOOD BUILDING produced by Goldman Properties. With a monochromatic black and white stripe chosen for the frame (plus just a hint of color in the form of two complimentary pastel stripes), I decided to keep the Wynwood Walls theme going by filling the frame with a shot of yours truly posing in front of the ultra bright and saturated diamond patterned wall painted by artist, Maya Hayuk. 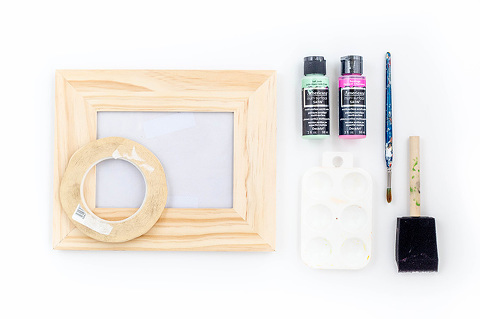 To kick the DIY steps off, I painted two coats of white acrylic paint on the wooden frame, allowing the paint to dry for about 30 minutes between coats. Then, I cut and placed strips of 1/4-inch painter’s tape on top of the white-painted frame in a pattern that felt close in style to the black and white WYNWOOD BUILDING. I changed the direction of the stripes every handful of tape strips to give it that cool, edgy look, and then finished by pressing the tape down firmly with my fingertips. Next, I used a 2-inch foam paintbrush to coat the majority of the frame in black acrylic paint, being careful not to push too hard in case paint got under the tape edges. Then, I used a smaller detail paintbrush to add in two pastel stripes just to give it a little bit of my own personal flair. I did two coats of paint on each of the three colors I used, with about 10-15 minutes of drying time in between. The drying time on this step is a little faster because you don’t want the paint to be too dry when you pull back the tape or else you run the risk of the paint coming off with the tape. Now here’s where everything started to come apart at the seams—literally. As I peeled back the tape, I started to notice that, despite my best efforts not to push black paint under the tape, my lines were pretty blurry and messy. I think the tape I used just wasn’t up to snuff after all, and black paint on top of white is just generally unforgiving when you’re going for crisp edges. Honestly, had I not been doing this for the blog, I probably would have scrapped the project, but for the sake of sharing, I soldiered on and used a small detail paint brush to painstakingly clean up the black, white, pink, and mint edges of all my stripes. Although it added close to an hour to my 30-minute project, I’m actually pretty glad that I kept going based on the finished frame. Would I use the same painter’s tape again? Nope (let me know if you have a good source for reliable 1/4-inch painter’s tape, by the way)! Would I go with black stripes next time? Probably not. But the results sport MAJOR impact and it’s such a fun memento from our trip to Miami. 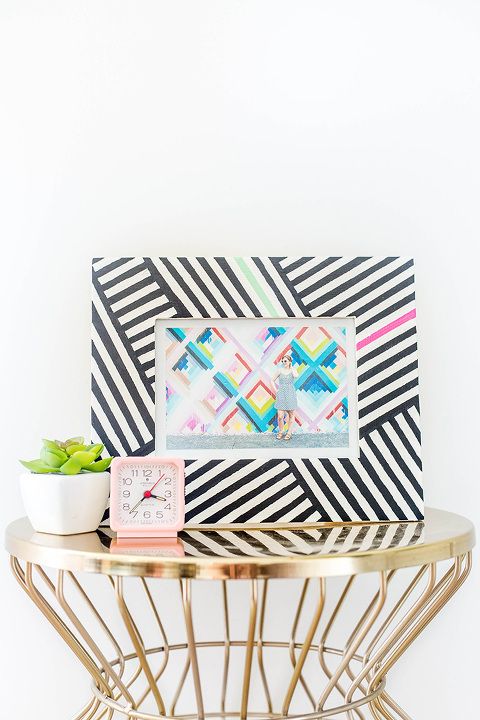 It didn’t go quite as planned, but the frame really did come out exactly how I had pictured it in my mind—I’m officially considering this DIY done! I could sense the foreshadowing of the bleeding paint, and I immediately thought of another blogger who’d shared a tip for clean lines. Hers was about painting her porch, but the principle is definitely still the same. It makes so much sense — it was a real “Well, duh! Of course!” moment for me.